Heyl & Patterson B Style Chocks – used for train stabilization and positioning. 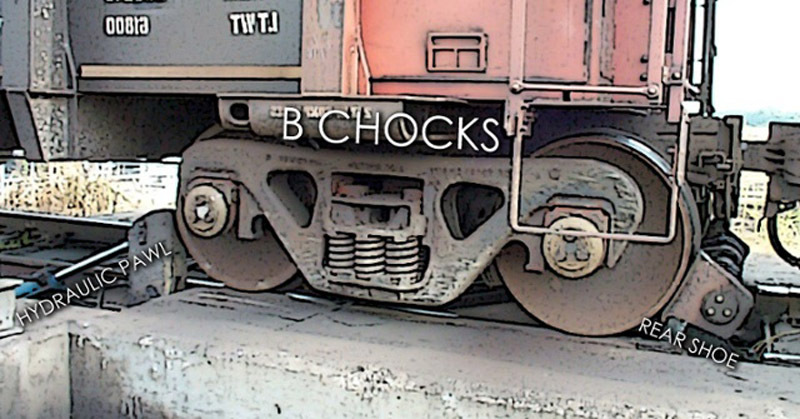 A chock is a stabilizing mechanism that allows for the holding of a railcar or series of railcars without the use of a brake. 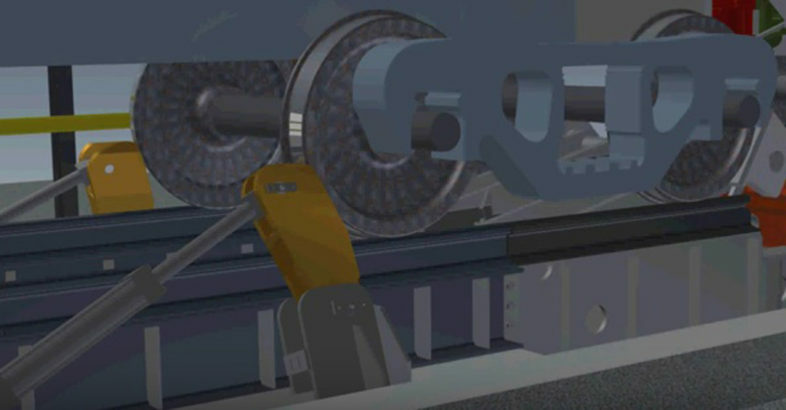 This holding system has a pivoting forward pawl system that engages the front wheel of the truck around the centerline of the wheel. In conjunction with the forward pawl is a traveling rear pawl assembly that pivots to move the entire train as much as nine inches. This system was designed to compensate for the variability of the railcar location introduced by factors such as draft gears, couplings, and track profile. This type is designed with a holding force up to 75,000 pounds. Chocks are ideal for loading, unloading and classifying operations where it is tedious for a rail operator to continuously set and reset brakes throughout their positioning process. Chocks will hold the train in precise place without the additional work of break setting, saving time and effort. With proper care and maintenance a chock system can last for 25 to 30 years, adding decades of improved safety and efficiency to any railcar moving operation. To learn more about chocks and other mechanical improvements, check out our Dumper Upgrades Brochure! Posted by Chelsea Finlay on Thu, Aug 25, 2016 @ 07:43 AM on the Heyl & Patterson Blog.